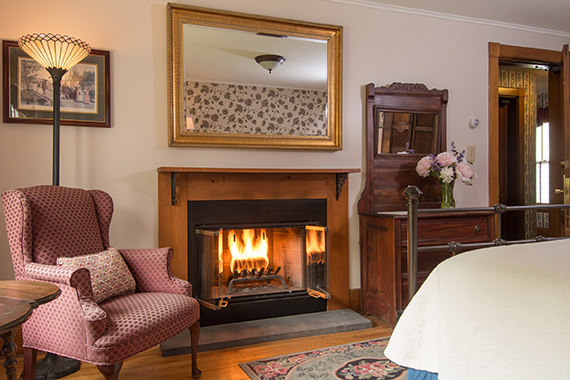 One of the original bedrooms in the main inn where you’ll enjoy watching flames flicker in the fireplace across from the beautiful king bed. The soft ivory, burgundy and navy color scheme complements the 19th century woodwork and armoire. A pair of wing chairs by the east-facing windows allows you to enjoy the view and the warmth of the fireplace. 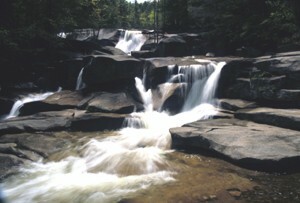 Although the waterfall is named Diana’s Baths, the room has only one with a tub/shower.